The lawsuit this film is based upon opened up a can of worms legally, completely changing Art Law, Cultural Heritage Law, Museum Law, and the Law of Wars forever. In regards to justice for a long-ago wrong, it is satisfying to know the bad guys didn’t win. 🙂 I’m curious to see if this film is any good! It was the sword of choice for the discerning Viking – superstrong, and almost unbeatable in battle. 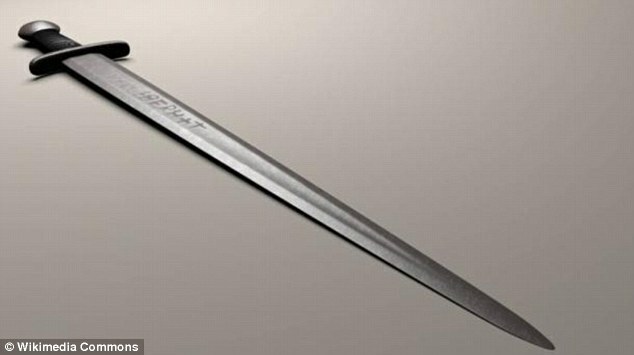 Yet mystery surrounds a small number of Viking swords researchers have uncovered. They are all inscribed with a single word – ‘Ulfberht’, which experts believe may reveal their maker. a single word – ‘Ulfberht’ – on the blade of a Viking sword. Experts believe a German monastry may have been responsible for the product of the superstrong weapons. About 170 Ulfberhts have been found, dating from 800 to 1,000 A.D. They are made of metal so pure it baffled archaeologists, who thought the technology to forge such metal was not invented for another 800 or more years, during the Industrial Revolution. Carbon is also mixed in to make the brittle iron stronger. Medieval technology did not allow iron to be heated to such a high temperature, so slag was removed by pounding it out, a far less effective method. The Ulfberht, however, has almost no slag, and it has a carbon content three times that of other metals from the time. It was thought that the furnaces invented during the industrial revolution were the first tools for heating iron to this extent. According to Ancient Origins, researchers are now closing in on the mysterious maker. ‘New research brings us closer to the source of the swords, to the kiln in which these legendary weapons were forged,’ it claims. About 170 Ulfberhts have been found, dating from 800 to 1,000 A.D. They are made of metal so pure it baffled archaeologists, who thought the technology to forge such metal was not invented for another 800 or more years, during the Industrial Revolution.